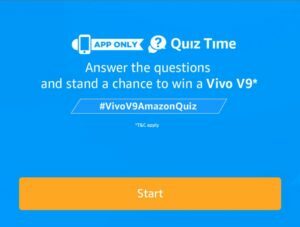 1 How to win Vivo V9 from Amazon Vivo Quiz? 2.1 Q1) What’s the aspect ratio of the Vivo V9’s display? 2.3 Q2) What’s the resolution of Vivo V9’s selfie camera? 2.5 Q3) Vivo is the title Sponsor of IPL 2018. 2.7 Q4) Which of these celebrities is currently associated with the brand Vivo? 2.9 Q5) Which of these is NOT a feature of the Vivo V9? All of us know that Vivo lauched its new smartphone Vivo V9 and to promote this mobile Amazon Vivo V9 Quiz is back, in which you have to answer 5 simple questions and we added Vivo V9 Quiz Answers. All the questions are based on Features of Vivo Smartphone. Vivo Communication Technology Co is a Chinese technology company owned by BBK Electronics that designs, develops, and manufactures smartphones, smartphone accessories, software, and online services. 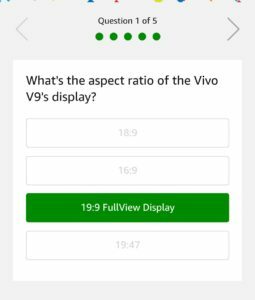 So, just this post to get all the answers of Vivo V9 Quiz. Just answer 5 simple questions to get a chance to win Vivo Smartphone. This quiz will remain live until 25th April 2018. You have to go to the bottom of the Amazon V9 Quiz App Home page to enter this quiz. We also added Amazon Vivo Quiz Winners List, you can check that from the below mentioned link. 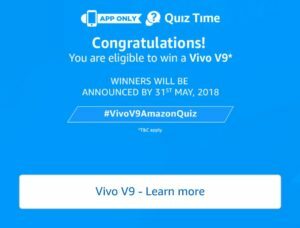 How to win Vivo V9 from Amazon Vivo Quiz? 2. Open the app and you will see a banner about the Vivo Quiz Time contest. Click on it. 3. Now click on the ‘Start’ button to begin the Amazon Vivo V9 quiz. Q1) What’s the aspect ratio of the Vivo V9’s display? Q2) What’s the resolution of Vivo V9’s selfie camera? Q3) Vivo is the title Sponsor of IPL 2018. Q4) Which of these celebrities is currently associated with the brand Vivo? Q5) Which of these is NOT a feature of the Vivo V9? 5. After answering all 5 questions correctly. That’s it. Just wait for the Winners list of Vivo V9 Quiz. There are a total of 10 (Ten) Prizes that will be given under this Contest. The Prize will be delivered to the winner on or before 30th June, 2018. 1. This Contest will commence on 5th April from 12:00:01 a.m. (IST) to 25th April 11:59:00 p.m.
5. The draw of lots will be carried out during the Contest Period for the questions and a total of 10 (Ten) participants will be selected as winners by a random draw of lots. 6. The declared winner(s) will be eligible for winning a Vivo V9 (Perfect Shot, Perfect View) phone with in-box accessories (hereinafter referred to as “Prize(s)”).